The real power of the Windows 8.1 Start button shows up when you right-click the Start button and display the pop-up menu. 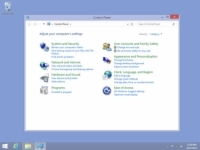 This pop-up menu provides quick access to a whole bunch of powerful features. 1Click Start to see your options. The pop-up menu lists your choices. 2The Programs and Features option only works with desktop applications. The first option you’ll see is Programs and Features. 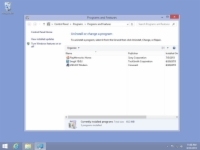 You can use this option to uninstall or change desktop mode programs. 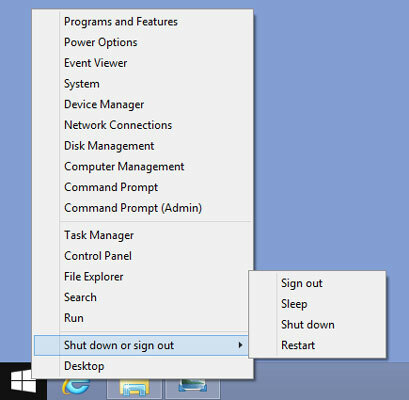 You can also use this option to turn certain Windows features on and off. 3The Power Options allow you to control how much electricity your computer uses. The next item on the right-click menu displays the Power Options. 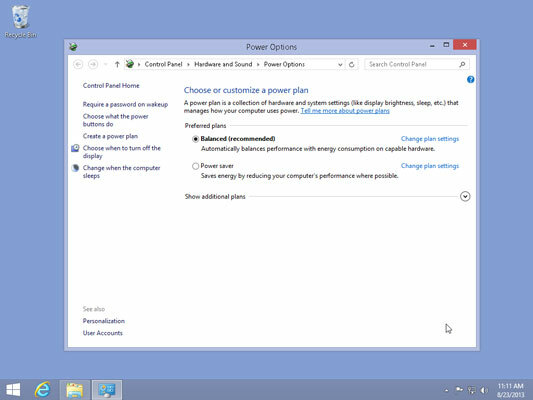 Use these options to fine-tune the balance between performance and how much power your PC uses. 4The Event Viewer is a power tool that enables you to see various events that your PC has recorded. These events might include things like errors that happened and when certain system services were started or stopped. In reality, most of what you’ll see in the Event Viewer logs is pretty cryptic and generally not all that interesting. You may find the Event Viewer useful in one particular scenario: when you’re dealing with a tech support person to resolve some puzzling problem you’re having with your PC. 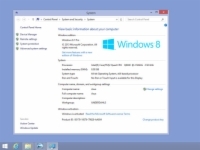 5The System option shows you information about your PC. 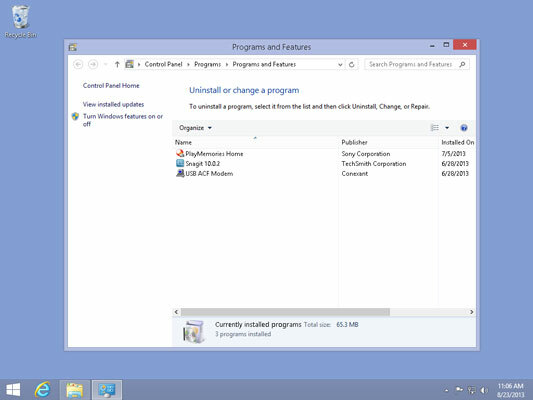 This option also gives you quick access to the option of upgrading to another version of Windows or adding new features. If you want to change your computer’s name or workgroup, the System option provides you with quick access to those settings. 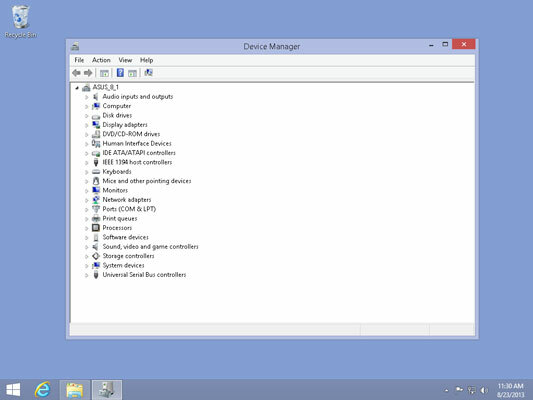 6The Device Manager shows you all of your system’s devices. Device Manager is an essential tool for troubleshooting misbehaving hardware. The Device Manager will display a red exclamation mark next to any devices that are malfunctioning. Resolving these hardware problems is often as simple as telling Device Manager to uninstall the device and then to scan for hardware changes. 7Network Connections can help you diagnose problems. You may find this option quite useful if you’re having problems connecting to your network or the Internet. You may see more than one connection here, depending on your hardware configuration. 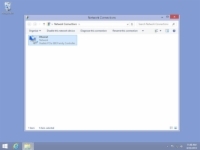 You need to select your network connection device before you’ll see the Diagnose This Connection option. 8You can use the Disk Management option to perform various tasks, such as repartitioning your disk drives and checking to make sure that they’re operating correctly. The Disk Management tools are extremely powerful and can render your computer unusable if improperly used. Unless you are absolutely certain of what you doing, leave these tools to the experts. 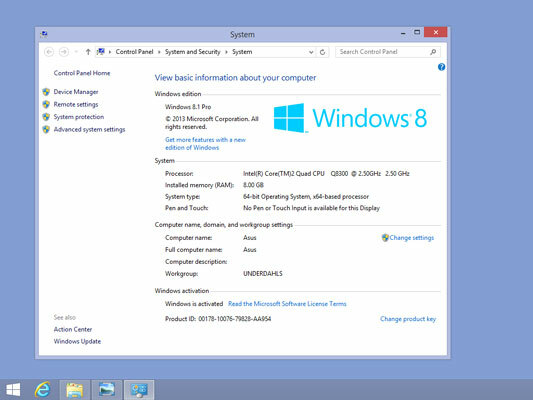 9Selecting the Computer Management option enables you to dig extremely deeply into the operation of your PC, such as showing which system services are running. If you thought some other tools had the potential to really mess up your system if they were improperly used, then you should be doubly afraid of the Computer Management tools. These tools should be used only by someone who knows precisely what he is doing and what effects the changes he is making will have on the system. 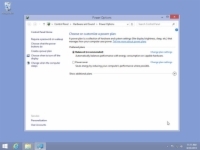 10Windows PowerShell is another expert user tool that you probably won’t ever use. Two Windows PowerShell options appear on the pop-up menu. The difference between the two is that the second one runs as system administrator, with higher-level privileges enabled. 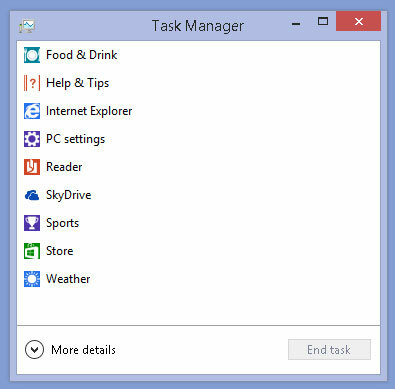 11The Task Manager is one of the more useful options on the pop-up menu. 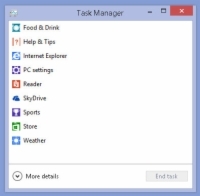 The Task Manager displays a list of all apps that are running on your system. If you want to see even more information about what’s running on your PC, click More Details below the list of running applications. For example, you can see how each app is affecting your system’s performance. If a particular application has stopped responding, you can select it in the Task Manager and then tap the End Task button. 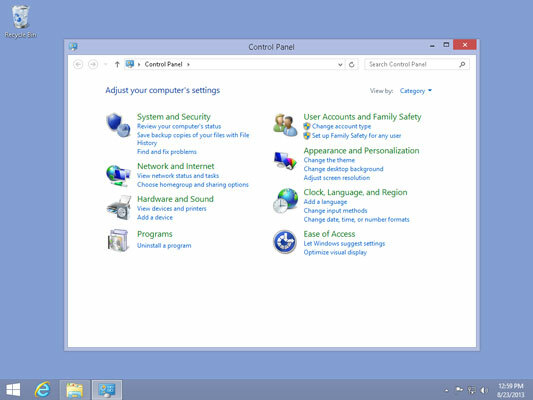 12The Control Panel provides access to virtually every setting on your PC. Even though Windows 8.1 makes it pretty easy for you to adjust many important settings without opening the Control Panel, you’ll probably find this option on the pop-up menu useful. 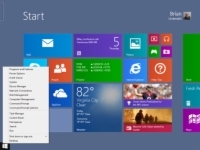 Choosing this option opens the traditional Control Panel that’s familiar from earlier versions of Windows. 13Use File Explorer to see what’s on your PC and network. 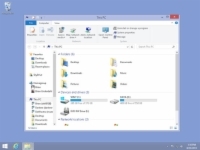 File Explorer enables you to see the folders and files on your PC. You can also see any shared files in your Homegroup or other network locations. 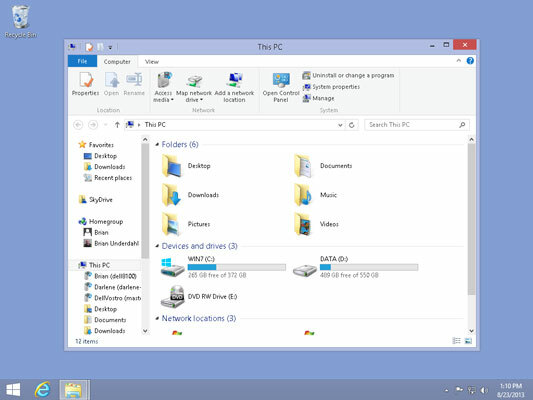 14The Search option on the pop-up menu opens the Windows 8.1 Search pane so that you can find your apps and files. If you’re at the Start screen, you can open Search by simply starting to type your search term. You don’t need to select Search from the pop-up menu. 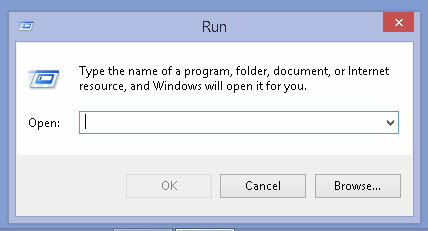 15The Run option on the pop-up menu opens the Run dialog box. This dialog box enables you to open programs, folders, documents, or URLs. The Run dialog box essentially functions the same way the Search pane does, so you probably won’t have much use for this option. 16The Shut Down option provides a quick shortcut to a second pop-up that you can use to put your system to sleep, power it down, or make it restart. These are the same options you’ll find under Power if you swipe in from the right side of the Start screen. 17The final item on the pop-up menu simply displays the Windows desktop, so you may find it handy if you’ve removed the Desktop tile from your Start screen. Choosing the Desktop option from the pop-up menu may cause any open desktop apps to minimize. You can click their icons on the taskbar to redisplay those apps.